At one point it looked like she started dancing for a few seconds before she stopped herself, and God, if that wan't the cutest thing I'd ever seen. Her cheeks were still stained pink from our kiss and her lips tilted up in a soft smile I was beginning to realize she only ever gave me. But I was so scared all I could do was whisper that she would be okay as I hugged her and tried to transfer some of my body heat. "Well, where else are we supposed to go for the game, you have the biggest TV!" "Your own place? What if Cass hated sports, or better...what if she hated y'all?" I smiled and dodged a pillow Adam threw at me. "I argue with your mama, I sleep on the couch and she doesn't feed me. So I don't argue with your mama." This was either the second or third Molly McAdams book I ever read. The first was Forgiving Lies--which I LOVED. I picked this one up without a clear picture of who Molly McAdams is as an author. All I knew was that I'd enjoyed a book (or two...I can't remember if I read Deceiving Lies before or after this one) by her and wanted to read more. So I read this book. I read it. I read this book. And this is the book that started my Molly McAdams addiction. I try to explain this all the time, but I can't seem to ever do my feelings justice. I just really adore her books. They hook me pretty quick, and then the stories set off into a level of sweetness that makes me feel happy. There's drama and there's heartache, but it's all bundled up into one fabulous package that I enjoy. 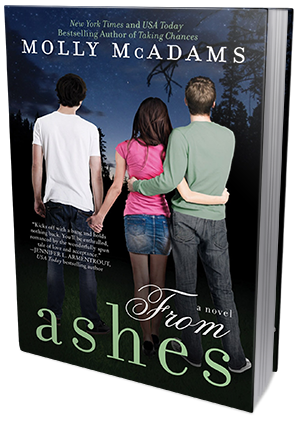 This book is the story of Cassidy and Gage, with a bunch of terrible meddling from Tyler. Seriously, I did not like Tyler. At all. Until the end of this book, I wanted to reach into the pages of this novel and slap the crap out of him. But Cassidy. She's the female MC. As far as female MCs go, she wasn't the most notable. Pretty with a brutal past, but looking forward to a brighter future now that she's in a situation where she actually CAN look toward the future. Doing her best day by day. I can respect that. She did kind of annoy me at times, but I never outright hated her. And I thought Cassidy and Gage as a couple was the best. So I'm on the fence with this girl, but I'm peeking over to the side where she's kinda cool, you know? Gage, on the other hand. GAGE I love. I mean, I wanted to slap him a couple of times myself (because UGH), but overall he's a sweet, kind guy I loved reading about. Definitely a gentleman. And willing to do anything for his girl. He wormed his way into my heart real quick and then stayed there throughout the book. At this point, I don't think I'm ever letting him go. I heart him. The plot wasn't really shocking and contained quite a bit of drama, but I was perfectly fine with that. The romance was fantastic, making me happy, and I was honestly interested in the story and what happened to the characters. I was invested in them. I laughed, I wanted to punch a wall, and my heart got sent all kinds of aflutter more times than I can count. It was a fun experience. My only issue with this novel was the info-dumping at the beginning. It was helpful information to know, but it was just...TOLD. I cared, and I was interested, but I would have preferred a more tactful approach instead of a big clump of info. Overall, I highly enjoyed From Ashes. The romance was amazing, I became so invested in the characters, and the story held me in its grasp from beginning to end. I'm definitely chomping at the bit to get my hands on the next Molly McAdams book!